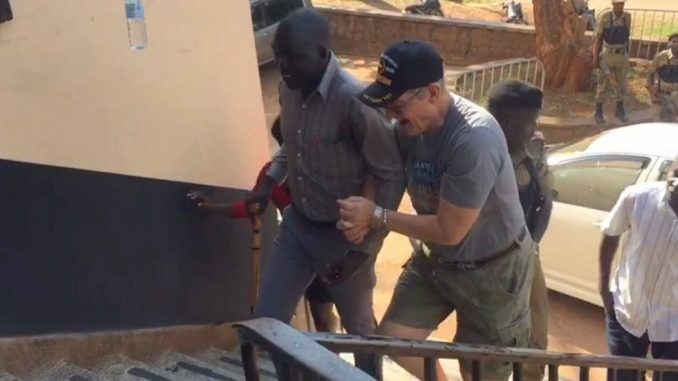 Jimmy Taylor, the racist American pastor in police custody in Kampala, Uganda. Police in Uganda are holding a Missionary of American nationality for allegedly assaulting a staff of Grand Imperial Hotel in Kampala. The Missionary identified as Jimmy Tailor was arrested on Friday after the employee of Grand Imperial reported an assault case at Central Police Station (CPS) Kampala. Police have since recovered the CCTV Camera video recording of the incident which occurred on Thursday night. Tailor dressed in a red t-shirt, Black shorts, and a black cap is seen chasing the hotel employee before descending on him and punching him several times of the face. 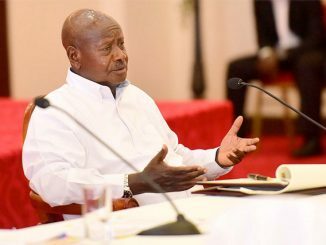 Tailor is also heard uttering vulgar and abusive sentiments, against the employee and Uganda as a country. And other employees are heard advising the victim not to retaliate and hit Tailor back. 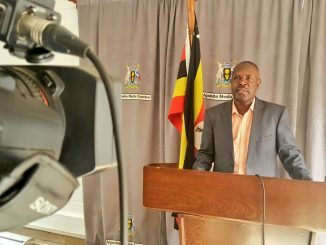 According to the Kampala Metropolitan Police spokesperson Luke Owoyesigyire, the suspect is now detained at CPS where he is facing charges of assault. 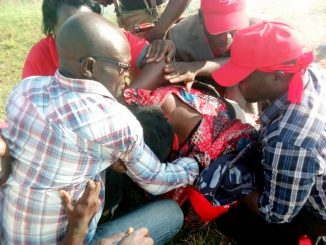 “He was a customer at Grand imperial and it’s alleged he assaulted one of the workers at the hotel in Kampala. He is currently detained at Central Police station Kampala on charges of assault. Investigations are ongoing,” Owoyesigyire says. “Thank you for your vigilance and sending us a video of an incident that happened at Grand Imperial Hotel. We have arrested the suspect, Jimmy Taylor, an American citizen,” Ugandan Police said on Twitter. The Ugandan man, who is referred to in the video as Francis, remained calm the entire time, even as Taylor kept calling him derogatory names. In the video, the racist American pastor kept trying to aggravate Francis but no no avail. This makes him more angry and he slaps the employee on the back of his head. A man in a blue shirt who attempted to intervene is caught in the tussle as Taylor tells him off. ““NO! NO! You obey what I say. I don’t obey you. Open my f****** room now! You b**** Look at me! Look at Christ who died for you,” the American says. At one point, he even tries to hug the man in the blue shirt amidst the insults. During questioning, it’s said that Tailor confessed to having assaulted the hotel staff but claimed to have a medical condition that made him lose his temper and senses. Police says the suspect will be subjected to a medical examination to ascertain the nature of the disease and the effect of its medication before proceeding with investigations.